Luke Wright has plied his trade in T20 all over the world - but he’d love to enjoy more success close to home and lead Sussex Sharks to glory in this year’s Vitality Blast. The 33-year-old has played in Australia, South Africa, Bangladesh, India, New Zealand and Pakistan as well as being a mainstay at the top of Sussex’s batting line-up for almost as long as the competition itself. 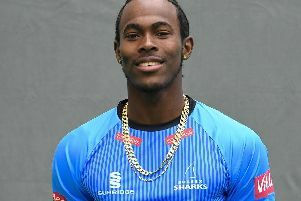 He was part of the team which won their only T20 title under Mike Yardy in 2009 and now, having relinquished his role in the Big Bash with Melbourne Stars during the winter and taken over as captain for this year’s Blast, he’s determined that Sussex justify their pre-tournament billing as one of the teams to watch. “We had all that success as a club a decade or so ago and it’s great for the supporters to remember those days because they were wonderful for everyone concerned,” said Wright, who led Sussex in the competition in 2015. "But when I look at the squad we have here I think it’s definitely capable of making some history of its own." Wright’s confidence does not appear to be misplaced. Stiaan van Zyl’s top-order experience will be missed as he recovers from a knee injury and there are fitness doubts over Tymal Mills. In addition, Chris Jordan will miss Sussex’s opening fixtures because of England commitments. But the sensational Afghanistan leg-spinner Rashid Khan, who is ICC world-ranked No1 bowler in T20 cricket, leads a formidable bowling attach that also includes Jofra Archer and Danny Briggs and Will Beer, two experienced T20 operators, and some meaty all-rounders. Sussex will still look to Wright for some explosive starts and it will be interesting to see how his new opening partnership with Phil Salt beds down, starting against Essex at Chelmsford on Wednesday, a venue where Wright blasted a memorable 153 from 66 balls in 2014. He brings massive T20 knowhow to the Sussex cause. Only 13 batsmen have accumulated more than his 6,747 runs in the format while only Chris Gayle has made more T20 hundreds than Wright’s seven. Of players with more than 6,000 T20 runs only AB de Villiers, Kieron Pollard and Gayle better his strike rate of 143.64. “I’m very proud of the career I’ve had but I still think there is a bit left in the tank,” he said. “Obviously I’ve got a lot of experience and I like to think I lead from the front but I’m very excited about what this team can achieve. As well as an old head on the field, head coach Jason Gillespie will bring plenty of know-how off it after his success with Adelaide Strikers in this year’s Big Bash. For once Sussex have had plenty of practice ahead of the tournament and Wright says they are ready to take it by storm. “It’s always a tough group to get out of but I think a lot of teams will look at us and see us as a threat,” he said.